A back extension machine is a machine designed for exercising the lower back by doing back extensions exercises. FOLDABLE: Wide frame design for stability. Folds up for a small storage footprint. MUSCLE TARGETING: Focus on back, hamstrings, glutes, and abs with the same bench. DURABLE: Thickly padded bench with stitched vinyl upholstery to last for years! The Hyper/Back Extension Bench by Titan Fitness is the versatile addition to your home or garage gym that will make a difference in your workouts and results. The Titan Hyper/Back Extension Bench is a must for improving core strength, isolating abs, and building powerful back muscles. With 5 height settings the Titan Hyper/Back Extension Bench allows you to turn up the intensity on your workout with the pull of a pin.Our Y frame design maximizes the footprint of the bench for greater stability and allows for a small storage footprint when folded. 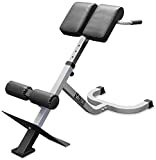 - Adjustability: 38" - 47 1/2"
This core abdominal workout machine is the perfect mix of efficiency, strength and flexibility training. 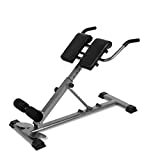 Compatible with a variety of different exercises and to target multiple muscle groups, this device is comfortable to sit on to continue with your workout. Designed to specifically work on core strength, this allows for a full range of motion when putting your body at an incline. Constructed with a sturdy metal frame, soft and supportive cushions for your body placement and a compact design, this is the perfect option for building up your home gym. Upgraded square tubing securing the torso pad to the hyperextension provides extra stability and security while using this machine. 20" x 12.5" footplate provides ample space fore a good base for the movement. Dual handles built for support before, during, and after the exercise. 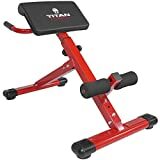 The Titan Fitness back hyper is a versatile addition to your home or garage gym that will strengthen your back, hamstrings, and abdominals exponentially. Adjustable from 34" to 43" from the footplate, this back hyper allows all athletes to train. 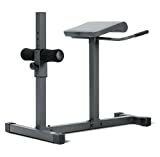 - Upgraded square tubing securing the torso pad to the hyperextension provides extra stability and security while using this machine. - Adjustable torso pad from 34" - 43" allows for athletes of different sized to use this piece of equipment. - 20" x 12.5" footplate provides ample space fore a good base for the movement. - Y-design maximizes the footprint of the machine, allowing for greater stability. - Dual handles built for support before, during, and after the exercise. - Adjustability: 34" - 43"
【Sturdy and Durable】With heavy-duty steel construction and max weight capacity of 220lbs. 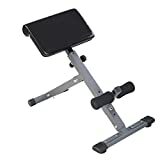 This back hyperextension bench is sturdy, durable and allows smooth positioning while exercising and moving. 【Versatile Equipment】This training bench can be used for a wide variety of abdominal workouts. It helps strengthen the lower back while targeting the glutes and hamstring muscles for superb workout. 【Convenient Storage】Its sleek and compact design allows users to store it conveniently in a corner in conjunction with the rest of your exercise equipment. Simply tuck it into a small space when it's not in use. VERSATILE EQUIPMENT - This training bench can be used for a wide variety of abdominal workouts. It helps strengthen the lower back while targeting the glutes and hamstring muscles for superb definition. Carve out the rock-hard abs you've always wanted with this equipment that allows you to perform challenging workouts to develop your core. INTEGRATED PADDING - This gym equipment comes with high-density foam, padded handles, adjustable two-foam leg holders, and polymer upholstery to accommodate a variety of workout regimens for your convenience and maximum comfort. GYM-AT-HOME EXPERIENCE - Whether you'd like to strengthen your core, ease back pain, improve your posture, or build your six-pack abs, the Marcy Roman Chair will bring you a safe and solid way to work on your fitness goals right in the comfort of home! Its sleek and compact design allows you to store it conveniently in a corner in conjunction with the rest of your exercise equipment. Simply tuck it into a small space when it's not in use. Have an optimal body workout and build some rock-hard abs with the Marcy Roman Chair! 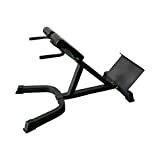 Made of premium-quality tubing frame with a powder-coated finish, this gym apparatus is guaranteed to stand the test of time. Its stability and ergonomic style allows you to perform intense workouts without having to leave the comfort of your home. Carve out those rock-hard abs you’ve always wanted with this training bench that can help you perform challenging exercises to develop your core. It can also strengthen your lower back and give superb definition to your glutes and hamstring muscles at the same time. The back hyperextension bench lets you position correctly while performing a variety of movements. Sit and lean backward to develop your core or flip over to perform back workouts with targeted motions. The Marcy Roman Chair features high-density foam, padded handles, adjustable two-foam leg holders, and polymer upholstery to accommodate a variety of workout regimens with convenience and comfort. Its sleek and compact design allows you to store it conveniently in a corner in conjunction with the rest of your exercise equipment. Simply tuck it into a small space when it’s not in use. Get into shape right in the comfort of your own home!